Loved by both adults and children alike, the Goliath™ Bean Bag will fast become the heart of any family home and make a real style statement in your relaxation space. Plenty big enough to share or spacious for one, the millions of beans inside the soft, cosy fabric will mould to your body and take you to relaxation heaven. Lovingly made here in Lancashire using our soft, chunky jumbo cord fabric that will add a touch of warmth and comfort to your relaxation space. The fabric is not only comfy but practical too its strong, durable, and machine washable. Complete the look with a matching jumbo cord footstool. Not only are our footstools perfect for putting your feet up they make wonderful little side tables for your phone or book or you could even add a small tray and use for your drink. 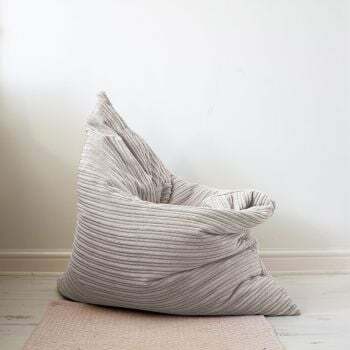 You will find hours of warm, snug comfort in our giant Goliath bean bag; spend time kicking back listening to your favourite music, watching TV or simply taking some time out to read a good book. Your new bean bag arrives ready-filled with ample amount of bead, giving you not only an abundance of comfort but plenty of support for your back. Super quality and looks stunning. Easy to fill too. Excellent quality materials used, with just the right amount of filling. The zip and stitching appear strong. I will definitely buy from them again. Used in our living room by everyone. Big enough for two but reserved for one lucky person per night. Excellent build quality. A feature of our living room. Fabric matches my sofa perfectly! Looks great but you need a lot of floorspace for this beanbag! How do I use a bean bag? Are you serious? I sit on it. I would recommend it to other people who would like to sit on a bean bag. Have'nt slept in bed since I got it. Seem very comfy as long as you are fit enough to get up again! Perfect for sitting in for hours on end, whether you're a gamer or a new mother with a baby to cradle for long periods of time. Also extremely comfortable to sleep in so it doesn't matter if you doze off! Purchased as a gift for a friend following my earlier purchase. Great product at a reasonable price. Sits in my living room and used to get comfy and watch tv or when visitors come around and extra seating is needed. Even used to sleep on on one occasion.